Edgar Varèse is regarded as one of the pioneers of New Music, and with good reason. His piece “Ionisation” was the first-ever composition written exclusively for percussion ensemble to be performed in a traditional concert hall setting; and he explored and searched intensely for sonic experiences. 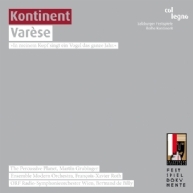 Varèse integrated first the world of sounds, then electronic instruments into traditional orchestras, thereby opening a door to a new awareness of listening. His work substantially influenced those generations of composers that came after him: a link between the beautiful, the exciting and the musically unfamiliar. The 2009 Salzburg Festival dedicated its “Kontinente” series to this brilliant New Music pioneer – and we are delighted to present these excellent recordings to you! From poetry to drama – Nono’s progress towards a "new modernism:" Das atmende Klarsein and Io, frammento da Prometeo in exemplary recordings. Finally available!